The Evaluation service is currently by request. If you are interested in having your screenplay evaluated/asssessed, please contact us to discuss availability. Ready to take your screenplay to the next level? Our Screenplay Evaluation is a detailed 5 - 15 page analysis of your screenplay -- plus hand-written in-script notes -- performed by an experienced and qualified reader/story analyst, who can show you how to improve your work. Unlike traditional "Assessment" services, our Evaluation service goes deeper, striking at the heart of what you're trying to accomplish. It's not just about "what's there" -- it's about "how to make it work". One of the major challenges writers face is this: The people reading and commenting on your script probably don't know what they're looking for. The fact is, READING a screenplay is as much an artform as WRITING one is. And unless they're industry professionals developing screenplays on an ongoing basis... your mother, your best friend, or your dear neighbour are simply NOT able to help. That's why writers tend to send their work out before it's hatched. Because they simply don't take the time to get an objective professional opinion on their work. Our readers read. They know what to look for because they're actively looking for it. By going deeper than traditional Coverage, they can pinpoint the exact places where your script needs work, and offer valuable suggestions for improvement. When you send your script in for our Evaluation service, the reader/story analyst does the standard Coverage. But we don't stop there. We zoom in on the problem areas. You get a 5 - 15 page document full of detailed notes and suggestions, including specific ways to fix or enhance your story, concept, characters, dialogue, scenes, structure, or whatever else may be the weak spots. And in your screenplay itself will be hand-written notes pointing the problem areas. You'll see your screenplay in a whole new light -- and take your writing to the next level. The simple difference between the Coverage service and the Evaluation service is the depth of the analysis. Reader Coverage is a document intended for the production company. It doesn't look at how to FIX any problems that might be there -- it's only concerned with what's there, and its value to the production company. An Evaluation, on the other hand, is a document intended for the writer, to help him or her identify problems with the script and suggestions for improvement. Coverage looks at "What's there". Evaluation looks at "How to fix it". Coverage is a 2 - 5 page document. Evaluation is a 5 - 15 page document. To most efficiently evaluate your screenplay, we'll need you to follow these instructions, to ensure maximum speed and efficiency. Your completed screenplay. It must be typed and printed in standard script form (Courier font, minimum 12pt size, no less than one-inch margins, scene headings, etc. ), on one-sided sheets of white paper, with each page numbered. Include a title page and bind the entire screenplay with brads that splay in the back. For evaluation purposes only, your submission may alternatively be unbound. A one-page synopsis of your screenplay. A return self-addressed envelope with postage affixed, for the return of your screenplay. The release form which you will find on the next page. 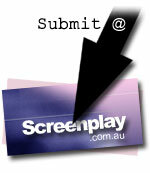 Full payment (cheque or money order) with your screenplay, or the reference number, if paying online. If your evaluation submission is received with any of the above items missing, we'll need to send the entire submission back in the return envelope un-read and un-evaluated. If the return envelope is missing, we'll notify you by email, and you'll have two weeks to supply the missing items. If we have not received them after two weeks, we'll be forced to return your payment and discard the screenplay. We cannot be held responsible for damaged, lost or misplaced screenplays. We advise you to send us a copy -- keep the original. All correspondence shall be conducted via email or post. We cannot afford the time to take phone calls or offer further one-to-one discussions of your screenplay. The evaluation we post to you shall be considered the extent of the agreement. The evaluation is protected by copyright, and the SCREENPLAY Development Centre shall retain that copyright. No part of the evaluation may be published or used in any form whatsoever without express written permission from us. Your screenplay is also protected by copyright, and we agree to respect it, and to keep all submissions strictly confidential. We reserve the right to return a screenplay and payment to you without evaluating your screenplay at our sole discretion without explanation. If you're ready to send your screenplay in for evaluation, please proceed to the next page, and follow the simple step-by-step instructions. Will yours be the next SNS?